Building on SMi’s continuous success and year on year growth in both Europe and across the USA, the Pharmaceutical Microbiology series is firmly becoming established as the industry’s premier platforms for updates on rapid microbial methods, sterility testing and contamination control. Don’t miss the chance to book your place before registration closes. The conference will host over 14 presentations from a mix of leading industry players and big pharma such as Eli Lilly, Genentech Glaxosmithkline, Johnson & Johnson, and more. Organisations who have recently secured some of the last few remaining places include: Amgen Inc, B.Braun Medical Inc., Boehringer Ingelheim Animal Health Inc, Genentech, Infinity Laboratories, Johnson & Johnson Trail Development Center, Pfizer, Prolong Pharmaceuticals and more! (1) Navigating the requirements of a modern QC Microbiology Laboratory led by Quality Executive Partners (QxP) (2) Contamination in Cleanrooms led by STERIS Corporation. New interviews and expert insight from those at forefront of cutting edge methodologies. Includes Q&A’s with Motif Biosciences, GlaxoSmithKline and Quality Executive Partners (QxP), available to view in the Download Centre. Pharmaceutical Microbiology East Coast 2017 is sponsored by Associates of Cape Cod, Inc. BioMérieux, Charles River, Neutec and STERIS Corporation. 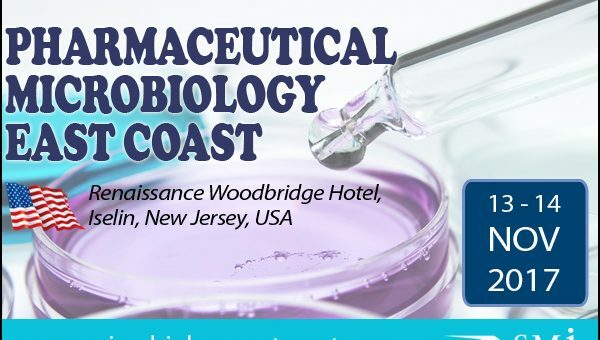 Pharmaceutical Microbiology East Coast’s exhibition area is co-located with our Superbugs and Superdrugs USA sponsors. Which means you’ll have access to network with sponsors and delegates from both events. Sponsors include: Associates of Cape Cod, BioMérieux, Charles River, Merck, Neutec, Soligenix and STERIS Corporation. For sponsorship packages: Contact Alia Malick +44 (0) 207 827 6168 or e-mail amalick@smi-online.co.uk.